Only one real ale available at The Mermaid in St Albans when we visited although it's a great pint - Everards Tiger. This pub used to be owned by Everards brewery but doesn't appear to be any more. It's disappointing to only see one real ale available as they used to have a good selection a few years back. Service was noticably slow, mainly due to the pub being surprisingly busy early in the evening (7:30pm on a Thursday) and only one person serving. With around thirty people drinking, the pub felt fairly full. As this pub is a couple of hundred yards from the main high street it is generally missed by the young crowd 'doing the circuit' and the clientele are mainly middle-aged regulars, mostly men. The other very noticable thing about the Mermaid is that it is very smokey - this will of course change after the smoking ban in the summer. The evening that we were there they seemed to have a darts match on against another pub so I guess this explained why the pub was rather busy. This is a typical locals' pub that would improve with a wider selection of real ale and a less smoky atmosphere (after July 1st 2007). Wi-Fi access is provided by The Cloud. Now serving up to six real ales and food is now available. Further review to follow soon. Now has one of the best selection of real ales in St Albans. Everards Tiger, Adnams Bitter plus four unusual guest ales were all available at the time of this visit. Service was quick and polite. Drinkers consisted mainly of middle-aged men watching football on tv; fortunately the volume was very low so this didn't spoil it for those not interested in the football. Be warned that every other Sunday evening Karaoke takes place! The Ale and Cheese night on Thursdays sounds much more appealing. Jam sessions occur every Monday with live music every weekend. A good pub with traditional interior and great selection of real ales. Under new management. 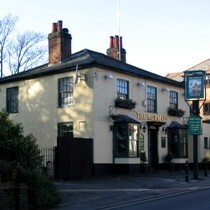 The people who used to run the Lower Red Lion are now running the Marmaid. Eight handpumps serving a range of non-standard ales. One of these is normally a dark ale (porter, stout, dark mild). Bands play most weekends.